The referral management market is categorized on the basis of type, component, delivery mode, end user, and region. By type, the market comprises self-referrals, professional referrals, and third-party referrals. The market, by component, is categorized into software and services. Based on delivery mode, the market is categorized into web-based, on-premise, and cloud-based. The market by end user is segmented into providers, payers, patients, and others. Based on region, the market is divided into North America, Europe, Asia, and the Rest of the World (Pacific countries, the Middle East & Africa, and Latin America). A number of factors such as legislative reforms (for example, the Affordable Care Act (ACA) in the U.S.), increasing government initiatives to incorporate IT solutions in healthcare globally, rise in aging population and incidence of chronic diseases globally, and the shortage of nursing staff and doctors are driving the growth of this market. Referral management solutions also provide several benefits they reduce costs, streamline operational processes, increase patient throughput, and improve the overall quality of healthcare. Their benefits are another factor boosting the adoption of these solutions. However, despite the numerous benefits of referral management solutions, certain barriers such as the failure to reduce outpatient attendance, lack of skilled healthcare IT professionals, and concerns regarding the security of patient data are hindering market growth. The North American market dominated the global market in 2014. The largest share of the market can be attributed to the various government initiatives that encourage the direct or indirect adoption of referral management solutions in the region. Similarly, government efforts to increase adoption of IT into healthcare, including referral solutions, in various countries in the European and Asian regions, as well as the need for providing quality care at affordable costs, are expected to stimulate the growth of the market in those regions. This report studies the global referral management market over the forecast period of 2014 to 2019. This market is estimated to grow at a CAGR of 22.1% to reach $2,686.3 million by 2019 from $988 million in 2014. The referral management market is categorized on the basis of type, components, delivery mode, end user, and geographies. The type, comprises self-referrals, professional referrals, and third-party referrals. In 2014, the professional-referrals segment accounted for the major share of the global market, by type. By component, the market comprises hardware, software, and services. 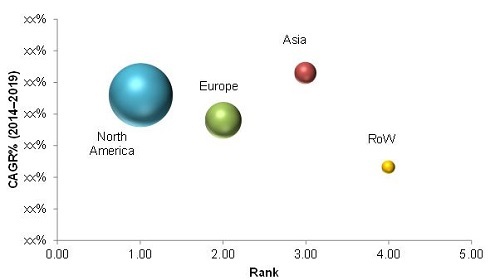 The software segment accounted for the major share (in 2014) of the global market. Based on delivery mode, the market is segmented into web-based, cloud-based, and on-premise solutions. The cloud-based solutions accounted for the largest share of the global market in 2014. Key factors that are expected to spur the growth of this market are increasing government initiatives to incorporate IT in healthcare, the rise in aging population and the incidence of chronic diseases globally, the benefits of referral management solutions, and the shortage of nursing staff and doctors globally. However, referral management solutions fail to reduce outpatient attendance; this, along with the lack of skilled healthcare IT professionals, is hindering the growth of this market. On the basis of region, this market is segmented into North America, Europe, Asia, and the Rest of the World (RoW). The North American market dominated the global market in 2014, followed by Europe and Asia. The large share of the North American market can be attributed to various government initiatives that encourage direct or indirect adoption of referral management solutions, and rising pressure to reduce healthcare costs. The Asian market is relatively new to referral management; however, the increasing HCIT adoption, proficiency of IT skills, and growing healthcare spending in the region is expected to drive market growth. 12.2.1.1 Referral Management Solutions Help in Curbing Healthcare Costs in the U.S.
12.2.1.2 Rising Prevalence of Chronic Diseases in the U.S.
12.2.1.3 Increase in Aging Population in the U.S.
12.2.1.5 Conferences to Create Awareness About Referral Management in the U.S.
13.1.1.1 Allscripts Healthcare Solutions, Inc.
14.2 Allscripts Healthcare Solutions, Inc.
14.9 Clarity Health Service, Inc.